As you're reading this post, I'll be travelling back home after spending a wonderful staycation on the North Norfolk coast. 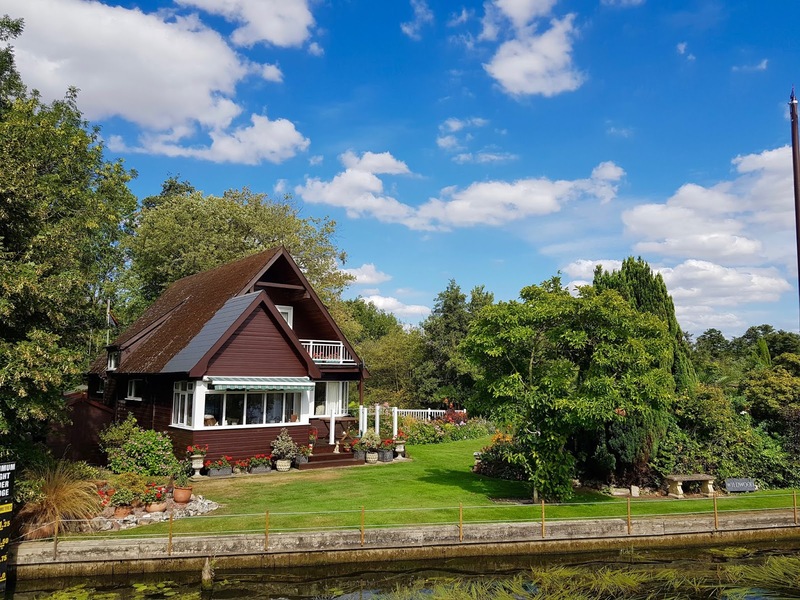 My sister and I booked a getaway in a charming country cottage right by the seafront where we indulged in a week of sun, sea, and sand (oh, and plenty of chips and ice cream as well). 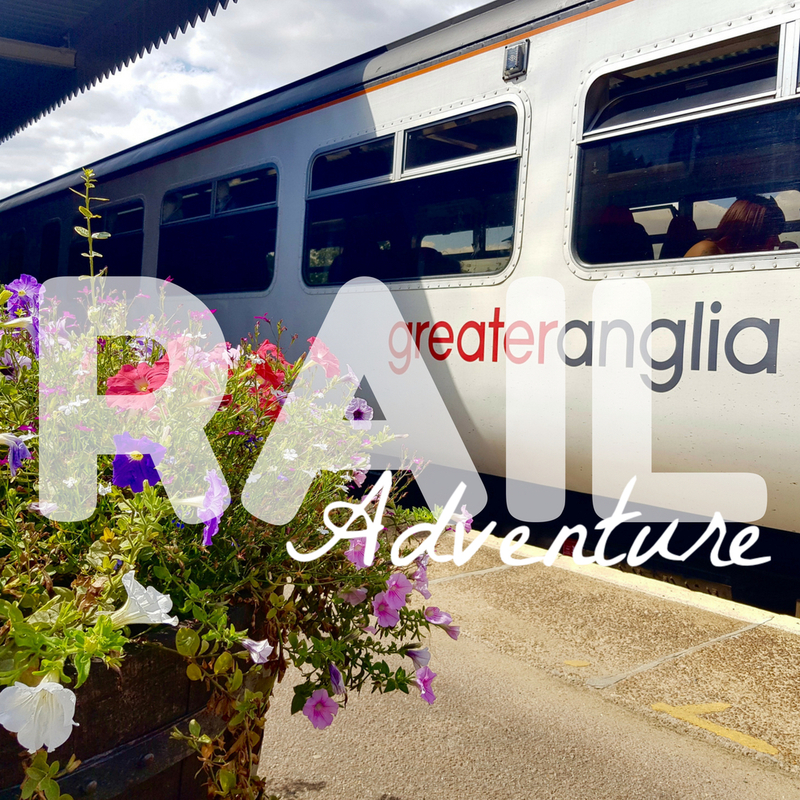 As part of our week away, I was invited by Greater Anglia to explore even more of what Norfolk has to offer, in particular when travelling by rail. It won't surprise you to learn that in this blog post, I'll be telling you all about how I got on! But first, here's an introduction to the beautiful county of Norfolk and to the joys of travelling by train. Buckle up and enjoy the ride! Filling up your lungs with fresh Norfolk air in the morning really is a delight. It doesn't just prove a hit with human visitors - the wildlife seems to love it as well! 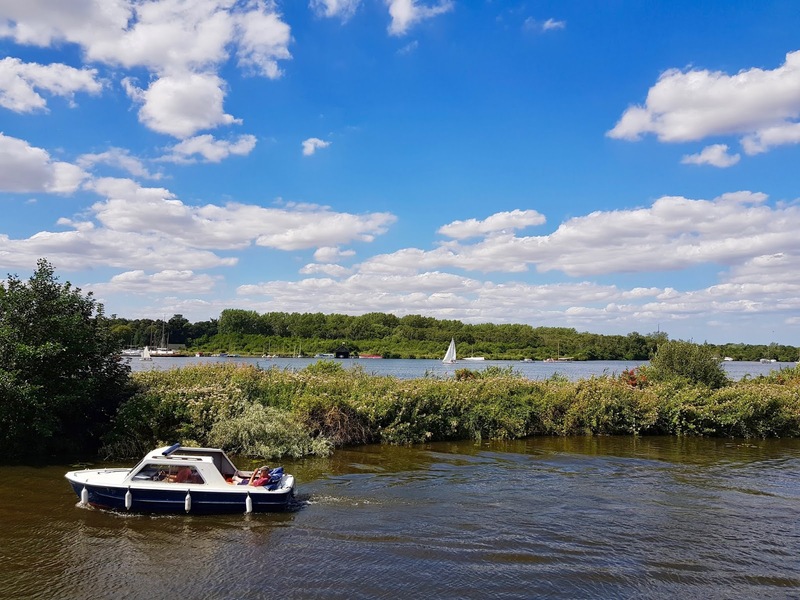 You can spot an enormous variety of flora and fauna across the beautiful county of Norfolk, from seals and their pups at their breeding grounds in Blakeney Point to elusive kingfishers which even live in the rivers of central Norwich! Rare birds called nightjars also have a stronghold in Norfolk, as do hawker dragonflies. So, whether your taste in wildlife is for creatures great or small, the county will have something to satisfy you! Sing it with me now: "Oh I do like to be beside the seaside!" Norfolk can boast nearly 100 miles of beautiful coastline, with its beach at Holkham and Wells holding the title of the best in Britain! I can attest to how clean and unspoiled these beaches are - the seaside at Cromer where we stayed was pretty much immaculate with no pollution and very few instances of littering, which was great to see. The beach at Cromer definitely comes highly recommended by me, but Sea Palling is just as lovely to visit if you want to feel the sand between your toes. If you're more of a city break person, Norfolk can still come up trumps in the form of its largest city: Norwich. I grew up going to Norwich at weekends, visiting the excellent shopping attractions of the market, Castle Mall, and intu Chapelfield, as well as the cultural and heritage highlights of the Castle, Cathedral, and the Sainsbury Centre. I've dedicated an entire blog post in the past to joys of a trip to Norwich, so do head over to that post if you're planning on visiting this charming city. It's all well and good for me to tell you to pack your bags and head off to Norfolk immediately but how are you actually going to get there? Here's why I'm an advocate of travelling by rail! When someone else is behind the wheel, you're free to eat, drink, nap, read, listen to music, dance, and cartwheel to your heart's content. (Ok, maybe not the last one, but you get the picture). I travel by rail frequently to see friends and family and the main reason that I choose this over driving is that I'm able to sit and do some work on the train, or just chill out and read my book. This freedom is a huge advantage. There's nothing more frustrating than being stuck in a traffic jam just moments from your destination. With rail travel, traffic is not an issue. Wave goodbye to road rage from the comfort of your carriage! Did you know that trains are more energy-efficient per passenger mile than planes or cars? Train travel is one of the most eco-friendly transportation options out there, second only to walking or cycling. It's great to know that you'll be making a sustainable choice by taking the train! Travelling by rail means that you can start your adventure as soon as you board the train! Train travel provides an opportunity to take in scenic views, enjoy the ride, and pretend you're aboard the Hogwarts Express, having just departed Platform 9 ¾. Driving is about getting from A to B, while on the train, you can really savour the experience of travelling. There's definitely a feeling of nostalgia to rail travel too - if your imagination hasn't gone wild with turning you into Hermione Granger, you might like to imagine yourself trussed up in a fur coat on a journey to Moscow with Anna Karenina, or about to solve a mystery on the Orient Express with Poirot! Now for the part of the post that you've all been waiting for: my rail adventure! 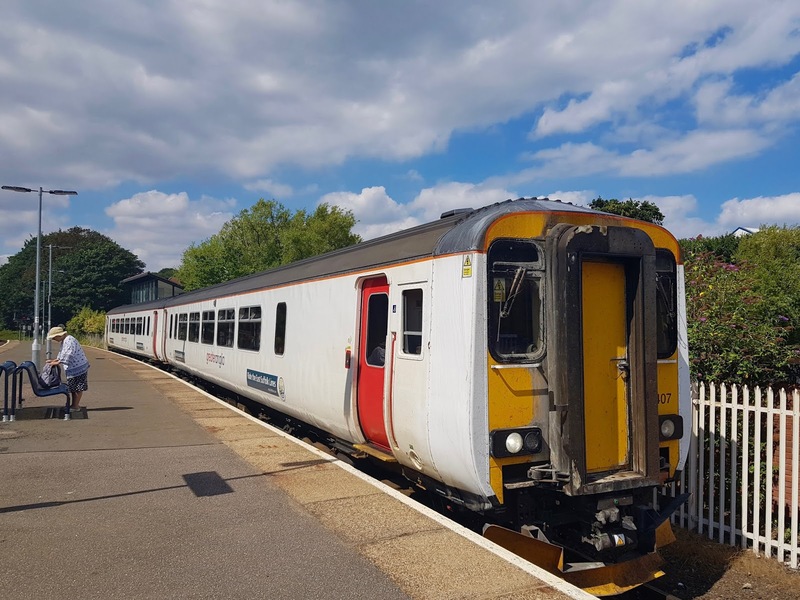 My sister and I hopped onboard a Greater Anglia train at Cromer station and soon arrived at Hoveton and Wroxham. 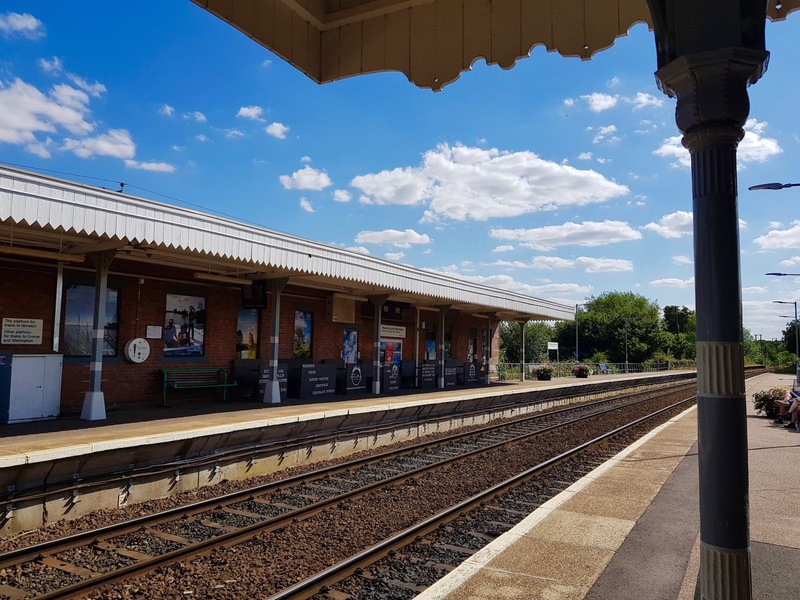 There were plenty of families also on days out by rail when we made our trip, which is unsurprising given that accompanied children travel on off-peak Greater Anglia services for just £2 return! 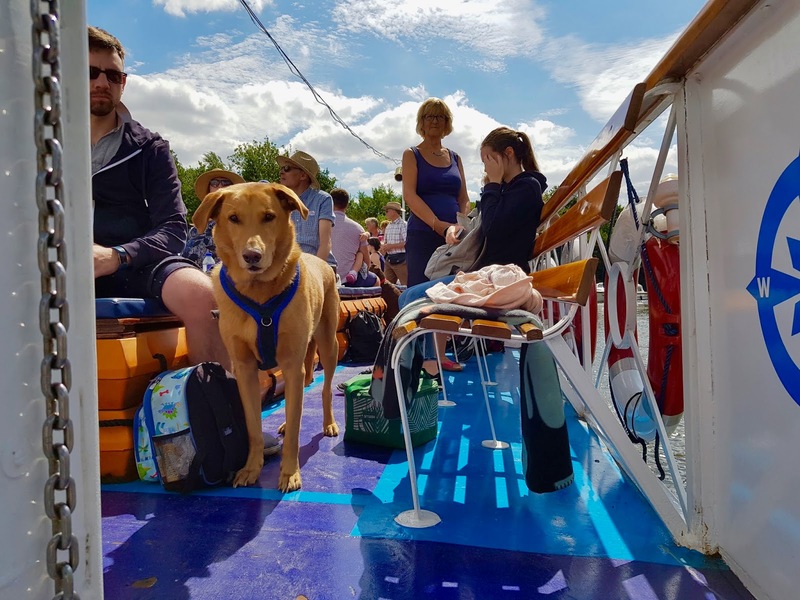 After our smooth trip, we made the short walk from the station to Norfolk Broads Tours to collect the tickets for our cruise. 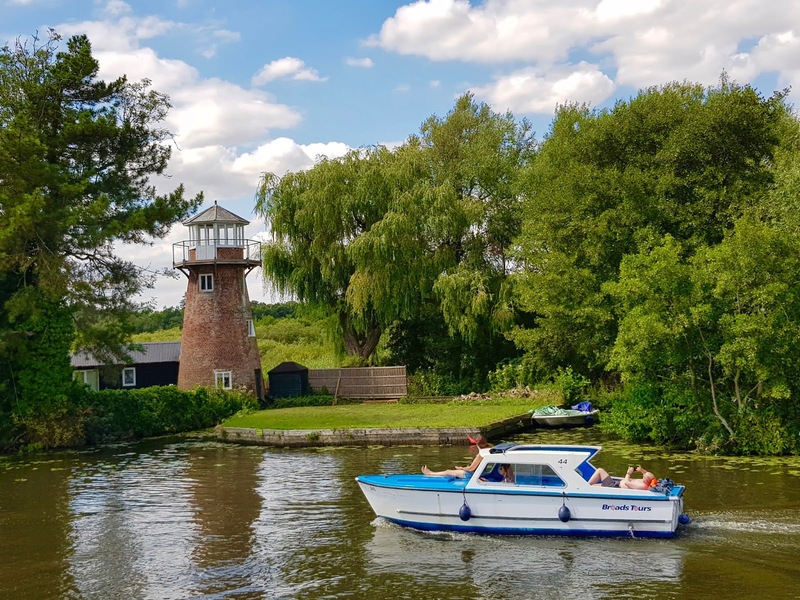 For those who haven't heard of them before, the Norfolk Broads are a network of largely man-made navigable rivers and lakes, known as the Venice of the East! Believe it or not, thanks to these Broads, Norfolk has even more waterways than Amsterdam! 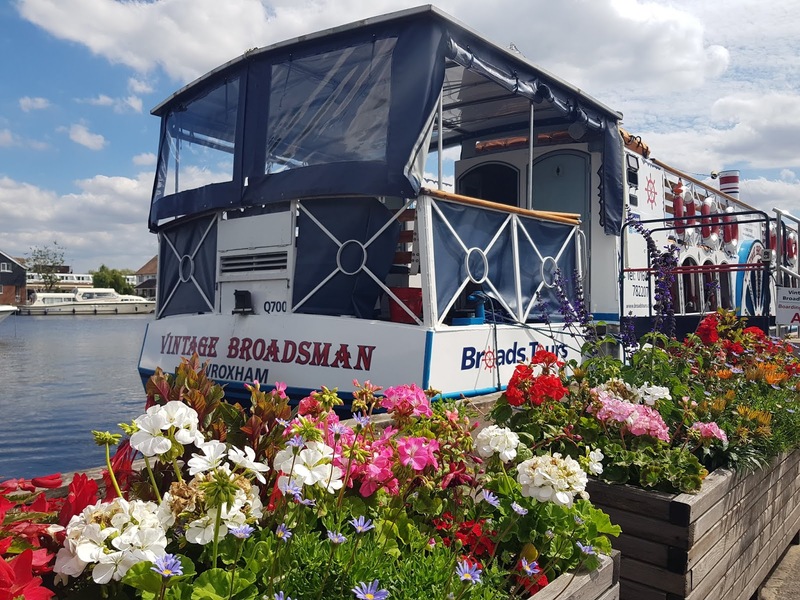 Our Broads cruiser was called the Vintage Broadsman, a beautiful open-topped vessel which provided stunning panoramic views of the surrounding countryside. The Broadsman was well equipped with toilets, a well-stocked bar, and seating set over two levels, enabling you to duck down below if a rain shower interrupts your cruise. 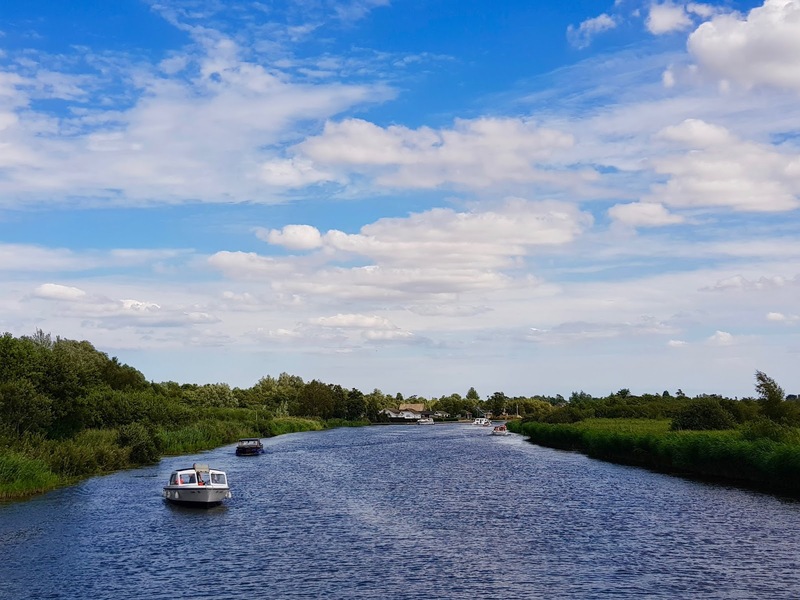 Our tour lasted two hours and gave a real taste of what the Broads has to offer. As well as cruising past some of the stunning homes which line the waterways (some costing upwards of a £1 million! ), we also got to see some of the wildlife which make the Broads their home. 1/4 of the country's rarest wildlife can be seen on the Broads, including the Bittern (a type of heron) and the swallowtail, Britain's largest butterfly. We didn't see a Bittern on our day out, but we were lucky enough to catch a glimpse of a pair of Cormorants roosting in a tree. They were a bit of an odd sight for mid summer as they have usually migrated by this time, but occasionally some pairs do remain over the warmer months. We also spotted a few Great Crested Glebes with their elegant orange feathers swimming around our boat - they were a beautiful sight! During the first half of our cruise, a guide gave us an audio tour of the surroundings, leaving us the second half to sit back and relax with our own thoughts. I really liked this balance, as well as the fact that the audio guide wasn't pre-recorded, it was delivered live. This really enhanced the experience as our guide was very humorous and responded to what we were actually seeing - a big plus! All too soon our cruise was over and it was time to hop back on our Greater Anglia train home. I had a fantastic time on my rail adventure and would definitely recommend the experience. If you're tempted to replicate my day of fun yourself, you'll be delighted to hear that it won't burn a hole in your pocket. Greater Anglia offers great value off peak fares with 2FOR1 on top London attractions and if you book in advance: tickets from Norwich to London are available for as little as £10. You can also travel from Cambridge to London for £7, and from Southend to London for just £5 one way! You can plan your route via the National Rail website and book tickets with Greater Anglia.